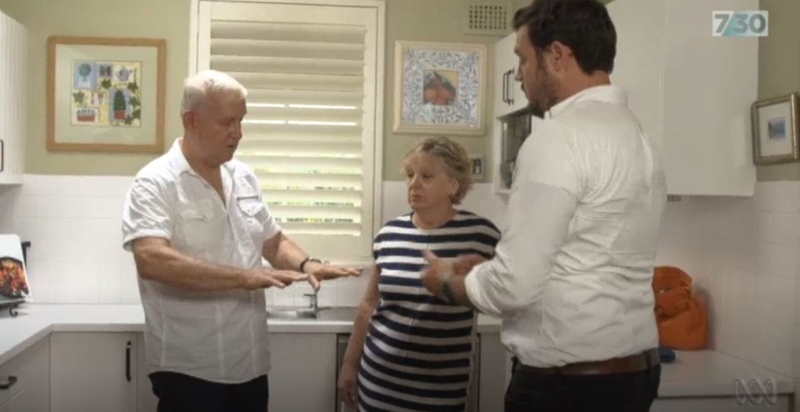 ABC’s 7.30 Report follows the journey of David Harvey as he undergoes MRgFUS treatment for essential tremor at Sydney’s St Vincent’s Hospital. MRgFUS is rapidly becoming the most common treatment for medication refractory severe Essential Tremor internationally (Abe K, Taira T). Congratulations to the exceptional team: Neurosurgeon Dr Ben Jonker; Neurologist Dr Stephen Tisch; and Neuroradiologist Dr Yael Barnett who worked together to perform the first non invasive “incisionless” neurosurgery in not only Australia but also the Southern Hemisphere – using Exablate Neuro MRgFUS. 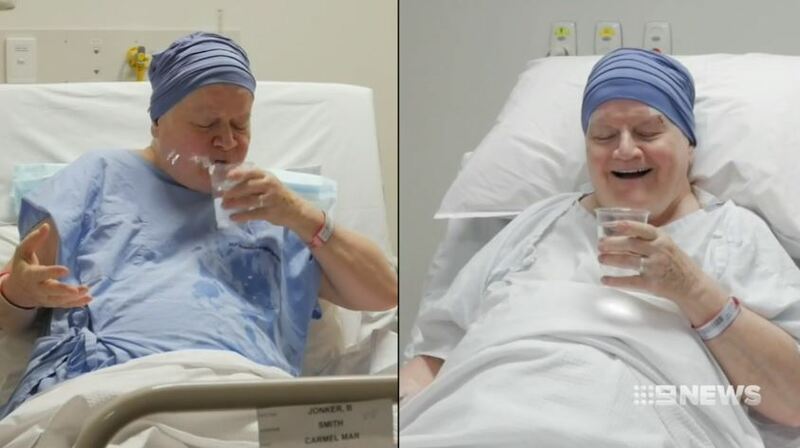 The procedure was performed at St Vincent’s Hospital in Sydney, which became the 58th site world wide to join the elite ranks of world leading neurosurgery centers performing MRgFUS, alongside Mayo Clinic, Stanford University Hospital, Brigham & Women’s (Harvard) and Imperial College London. Exablate Neuro is the only focused ultrasound device approved for registration by the FDA in the US, across Europe, Japan, Korea, Taiwan, Israel, Vietnam, Singapore, Thailand, Australia and other countries to treat patients with a range of neurological conditions. The procedure uses ultrasound through an intact skull. There is no need to create a surgical incision, use implants or ionizing radiation or drill through the skull. Instead, 1024 beams of ultrasound are focused, extremely precisely on the desired location. MRI provides high resolution visualization allowing the treating clinician to see exactly where the ultrasound is focused inside the brain, with patient specific treatment planning and continuous real-time monitoring of the procedure. MR-guided Focused Ultrasound (MRgFUS) is an incisionless procedure used to create a highly accurate and controllable lesion in various locations of the body. The process combines ultrasound treatment with real-time MRI to monitor effects and exact temperatures. The treatment of Essential Tremor and other neurological conditions such as Parkinson’s, OCD and neuropathic pain using MRgFUS therapy is also known as Neuravive therapy. Neuravive therapy focuses ultrasound energy to target different locations in the brain. One critical difference with MRgFUS thermal lesions compared to lesions created surgically is the use of sub-therapeutic dosing of ultrasound. This temporarily simulates the effects of the full-strength dose. This allows the clinician to make adjustments, checking effectiveness, side effects and patient feedback to ensure the safest and most effective results. 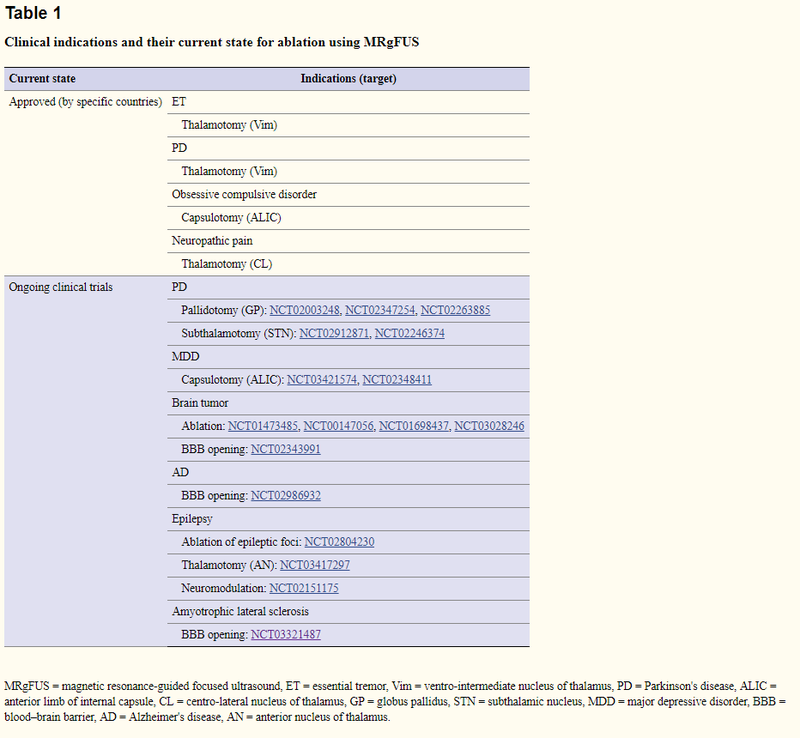 MRgFUS Therapy (650kHz) is currently indicated for the creation of a lesion. Lesions have been shown to be effective for a range of indications. Lesioning has a long history with several thousand publications in the field. Neuravive avoids the need to drill through the skull and insert a probe through the brain to access the target. It is also more precise and routinely sub mm precision. The use of low dose to create a reversible effect allows the treating clinician to assess efficacy and complications before making a permanent lesion. Following the creation of the lesion, transient edema forms, believed to peak at 48 hours or so post operatively, resulting in transient neurological side effects that resolve as the edema resolves. As MRgFUS is a rapidly growing field, evidence for various indications is building and the technology and practice being refined for that application. The chart below provides a snap shot (Source: Focused Ultrasound Foundation). It is important to distinguish between the 650 kHz headset, which has widespread regulatory approval and the 220kHz headset, which is used in research. 220kHz research is mostly focused on leveraging and optimising blood brain barrier and blood tumour barrier focal transient opening. 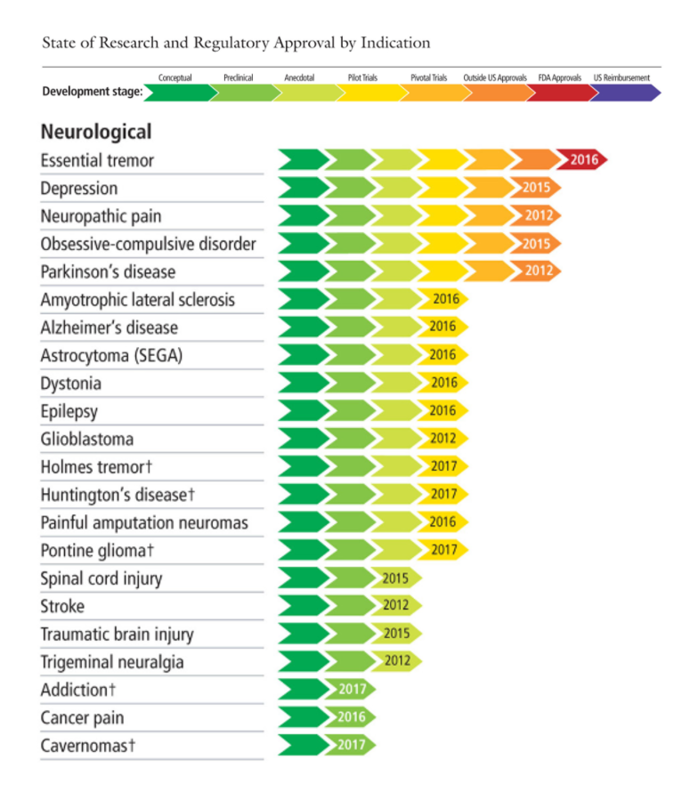 The area of neurological science, stereotactic functional neurosurgery, and movement disorder neurology (with familiarity of surgical interventions), are highly specialised. Clinicians should refer to appropriate sub specialised expertise of a specialist familiar with all the therapeutic options including MRgFUS, Deep Brain Stimulation, Surgical Thalamotomy, Gamma knife and the non surgical interventions, should be sought for best care. First line treatment for Essential Tremor is pharmacological. The International Essential Tremor Foundation lists medications including the on and off label use of agents such as Propranolol, Primidone, Topiramate, Alcohol, Clozapine, Mirtazapine, Gabapentin, Benzodiazepines and Botulinum toxin. For medication refractory patients there are 3 surgical options, Gamma knife, Thalamotomy, and Deep Brain Stimulation. The treatment of a particular patient in this field is best assessed by a clinician sub specialized in the area and familiar with all the recent advances and evidence across the therapeutic alternatives. For MRgFUS in particular being current is essential, due to the pace of advances and development of the field as best practice refines and evidence is published for these refinements. Extensive evidence, 1000+ publications, are available for thalamotomy for tremor. The use of MRgFUS is the newest method of thalamotomy. In common with many surgical approaches this is a thermal lesion, except no contact with the target tissue is required and no incisions of other penetration of the body is needed. Thalamotomy interrupts the movement circuits associated with tremor, in a part of the thalamus – most commonly the VIM (Ventral Intermediate Nucleus). Thalamotomy is widely cited in international guidelines such as American Association of Neurology (AAN). Health Economics and Heath Technology Assessment. May 2018, Health Quality Ontario in Canada issued detailed positive Health Technology Assessment ; Positive UK NICE Guidance was issued in June 2018. There is US Medicare reimbursement, and widespread US health fund reimbursement. Israeli and other health authorities also conducted favourable analyses leading to reimbursement. Efficacy: Langford et al, Oct 2018, a rigorous examination of 1559 records demonstrated parity in efficacy between DBS and MRgFUS, in terms of health-related quality of life HRQoL. Mohammed et al, A meta-analysis noted that at 12 months a 62.2% improvement n overall Tremor (CRST). Chang et al Jan 2018, 2year follow up of, Elias et al, noted that Tremor improvement as sustained from reported by Elias at the end of year 1 (53%) was sustained at 2 year (56%), and some complications resolved. Safety: Galley et al, Safety and accuracy of incisionless transcranial MR-guided focused ultrasound functional neurosurgery: single-center experience with 253 targets in 180 treatments. Noted procedure related complications at 2.2% and minor, accuracy sub mm, and a non-statistical improvement in MMSE. Fishman et al, May 2018, examined all complications from early pilot studies and trials from 186 patients. Regarding adverse events. 79% are mild 20% moderate and 1% severe. No intra-cerebral hemorrhages or infections. Mohammed et al, A meta-analysis noted that at 12 months a 15.3% complication rate of mostly mild paresthesia. Zaaroor et al, reported that for the first 30 patients, no adverse event lasted beyond 3 months, i.e 0% non-transient. Reporting this 0% non-transient again in the NEJM, and again in 2018 at the FUS Foundation, reported 0% of adverse events at 72 patients. Insightec notes that as of November 2018, with 1500+ patients treated, the most severe adverse event reported has been a numb finger and thumb. 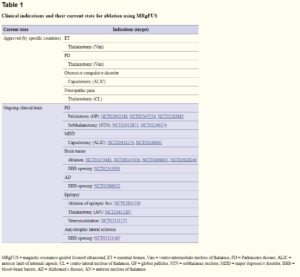 Ablation of targets in the brain is known to be effective for a range of conditions. The degree of this effectiveness and a patient’s suitability are best assessed by a sub specialist. MRgFUS provides an accurate means of ablation that addresses a number of issues with surgical ablation. Accuracy achieved with MRgFUS is sub mm, Galley et al, This is achieved in a number of ways. First the MRI scan used for treatment and diagnosis are the same – so error mapping from a diagnosis image to treatment image is avoided. Eg phase shift or, going from one imaging modality such as MRI and coordinate system to another either physical or ultrasound. Second MRI Thermometry – this new MRI sequence is overlaid on the conventional sequences (T2 etc), and shows the temperature precisely at each point, allowing the clinician to understand what is occurring at all points in the tissue. In conventional surgery a hot tip is placed on tissue, and while the temperature of the tip and tissue in contact is known, the temperature 1mm or 5mm away from the tip inside the tissue is not, and as heat conducts at different rates in different tissues the there will be differences away from the tip. Third using 1024 beams of ultrasound in a hemispherical array that coincide at a point, allows for more precision as it is the addition of all these beams at the point where they coincide that creates therapeutic effects. Software an the clinician can use the thermometry to correct from where the focal point was predicted to be vs where it actually is. A low dose of MRgFUS, neuromodulates the target. Thus the patient can be assessed for neurological efficacy and complications. If the treating clinician is not satisfied with the outcome of the test, the target is moved. The limitation is that only those complications that can be determined while the patient is lying on the MRI table fixed to a stereo tactic frame can be assessed. The MRgFUS field is advancing rapidly. This section was updated March 2019. During 2018 alone, there were in excess of 100 publications and presentations in the field, so clinicians are encouraged to seek out the latest reviews from PubMed or a similar source. 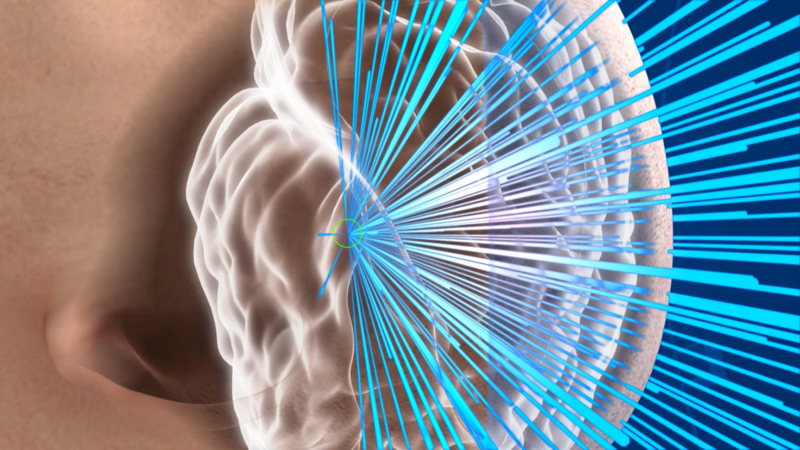 4 year efficacy data on MRgFUS for essential tremor (Feb 2019) Four-year follow-up results of magnetic resonance-guided focused ultrasound thalamotomy for essential tremor. Recent Therapy Class Review (Oct 2018): Magnetic Resonance-Guided Focused Ultrasound in Neurosurgery: Taking Lessons from the Past to Inform the Future. Jung, et al. Use of MRgFUS for Parkinson’s Treatment, Pallidotomy (Aug 2018): The efficacy and limits of magnetic resonance-guided focused ultrasound pallidotomy for Parkinson’s disease: a Phase I clinical trial. Jung et al. Discussion of Blood Brain Modulation for Neuro Gene Therapy (Apr 2018) Safe and stable noninvasive focal gene delivery to the mammalian brain following focused ultrasound. Stavarache et al. Patients may visit essentialtremor.net.au or see their doctor for a referral to a clinician familiar with MRgFUS and its alternatives. Clinicians wishing detailed information about the use of Exablate Neuro and MRgFUS therapy for Essential Tremor in Australia, please contact your product specialist.